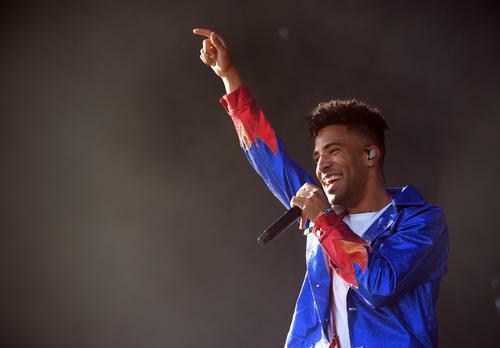 As a rapper, KYLE makes it a point to exude positivity in his songs. His single with Kehlani f his Light Mine album, “Playinwitme,” fits that prile perfectly, and he proved it during his recent performance TV performance the track for Jimmy Kimmel’s Concert Series. KYLE sets himself up nicely with a simple stage set up. A drummer and a keyboardist are present to perform a rendition the beat while another man pretends to play an arcade cabinet in the back, while actually hitting some dance moves instead. KYLE bounces around the stage, giving his all for his track dedicated to trifling girls, making certain to censor any swears out respect for Kimmel. After the first verse and hook has ended, the arcade machine begins to spin around, revealing that Kehlani was hidden there the entire time. Wow! She immediately matches KYLE’s energy, going through her verse while KYLE assists her as a hype man. It’s during her rendition the song’s chorus, however, that any adherence to keeping the language clean flies out the window. Inspired by Kehlani, KYLE decides he doesn’t care either and stops trying to censor himself. The duo continue to bounce around the stage, and encourage participation from the crowd. To their credit, the crowd does look genuinely captivated, despite they’re high likelihood actually being there to see Jimmy Kimmel. The whole thing is just an exercise in fun. Check you KYLE and Kehlani’s performance “Playinwitme” on Kimmel down below.